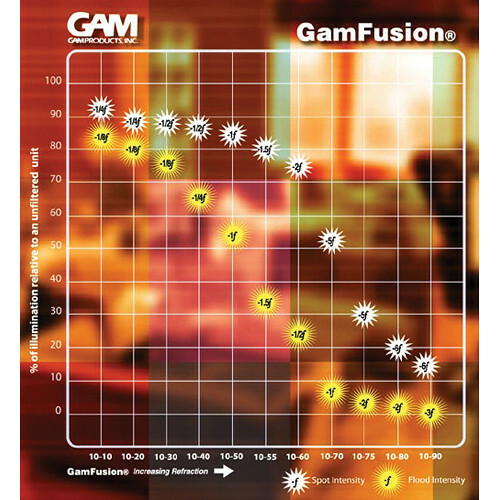 The GamFusion 10-30 Diffusion Material from GAM was designed to give the photographer or videographer an accurate, precise, and quantitative way to handle and manipulate light. Whether you merely wish to tweak or diffuse the edges of a portrait, reduce the quantity of light reaching the subject, or calculate a color conversion, GamFusion gives you a wide variety of options and "grades" to get the job done. The material comes in 11 steps of diffusion, starting with the almost clear 10-10 and sequentially progressing to its most diffused 10-90 grade, which is so dense it reduces the light beam intensity by 85%. With this 10-30 level of GamFusion, light is slightly diffused. It is good for shutters and barndoors. Minimal softening occurs. It is important to note that the approximate percentage of light loss and f-stop will vary depending upon the instruments selected, the beam spread, and the distance.